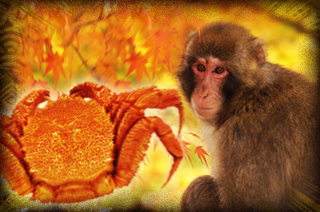 Let's move the crab and fend off the persimmon thrown from the Monkey. "That rice ball is all you get. But if you grow this seed, you can get many fruits. " Trusting what Monkey said, Crab traded rice ball with seed. Crab grew the seed and got many fruits. Then Monkey came and climbed the tree. It ate all ripe fruit and threw the immature fruits to Crab. Poor Crab got shot down and died. Children of Crab asked friends to help and took their revenge to Monkey.